Over the last few years, technology has revolutionised payment methods and made in-store cheque payments almost obsolete. Contactless payments make life much easier, especially for those who struggle to remember their PIN. The good news is that this technology is being expanded and soon it won’t just be cards we use. 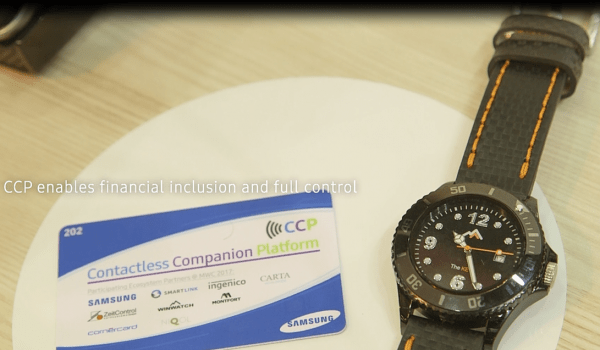 Samsung, in partnership with Smartlink and Ingenico have recently launched CCP which stands for Contactless Companion Platform. This enables consumers to pay for goods using anything they are wearing. That could mean a watch, wedding ring, key fob, sleeve or literally anything else we choose could be used. 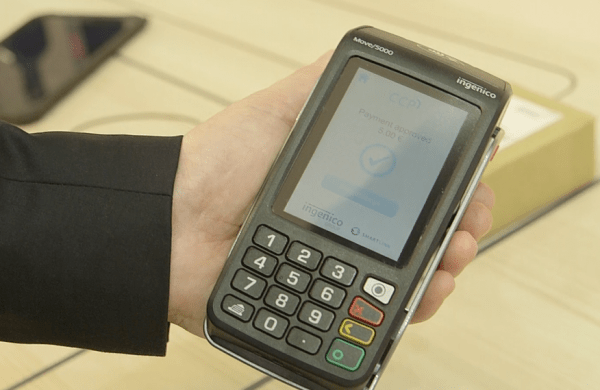 This innovative technology which replaces cash with closed-loop contactless payment was unveiled at the Mobile World Congress earlier this month and focuses the migration into digital cash. It is also a solution for consumers who currently cannot access payment cards. The CCP app is downloaded onto the user’s smartphone and then money is loaded onto the chosen object. Whenever that object makes a payment the phone gets a notification so you know exactly where the money is going. Credit cards, debit cards and bank accounts can be linked to the app or, similar to the Oyster card used for corner shops, it is also possible to use real cash. 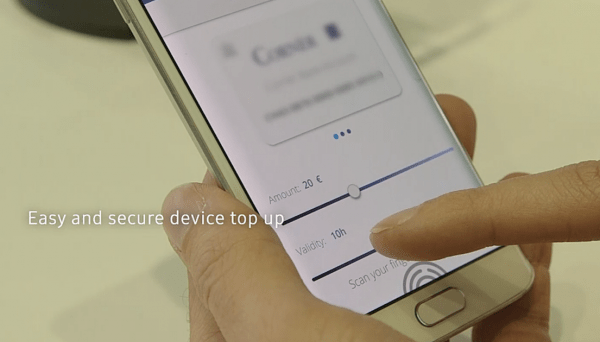 Money can be topped up using the app (for Android and iOS), PC and point-of-sale terminals. Simply tap the wearable item onto an NFC card reader in much the same way that you would use a contactless card and the payment is made. Obviously when using an item like a wedding ring for a contactless payment it opens up security issues. However, this can be solved with additional security parameters like choosing a particular location for a device of choice. 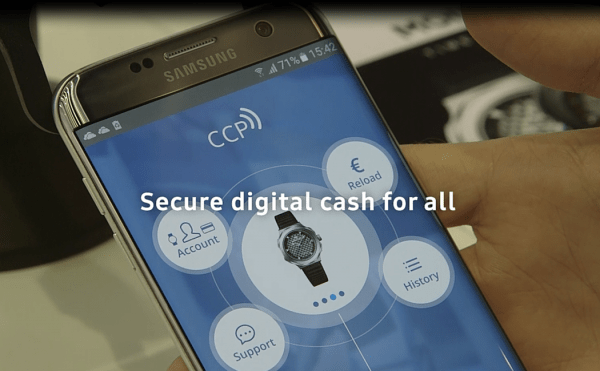 CCP can also combine the digital cash payments with travel cards, vouchers and loyalty schemes. 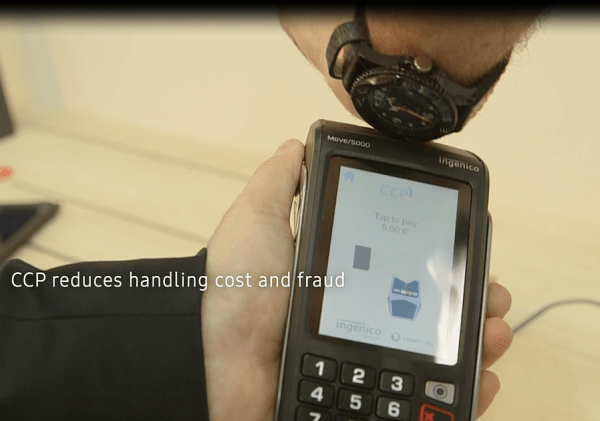 One device could discreetly be used for a whole range of contactless services. Swiss watchmakers Winwatch and Monfort already have an embedded CCP solution in newly developed mechanical wristwatches, combining traditional Swiss watchmaking with technical innovation. Both these devices were revealed at MWC. A Swiss Fintech company will shortly be introducing dedicated CCP-enabled smartcards in Eastern Europe. Which devices would you choose to utilise this exciting new technology?